Shor-Line cages are vital components to many animal care businesses. Our talented American craftspeople have been making these stainless steel beauties in our Kansas City manufacturing plant for decades. Now, you can purchase any of these stainless steel cages or their accessories for a great sale price...there are hundreds of options on sale!! Why do people like Shor-Line cages so much? Here are 8 reasons--one for every decade Shor-Line has been in business. 1. Premium craftsmanship goes into every cage. Our workers hand-weld and inspect EVERY cage so you receive the durability you expect from Shor-Line. 2. Strength is built in. Every cage has a 1"-square stainless steel tube frame. 3. Doors receive additional welds. We use computer-controlled welding at every intersection of the door because we know your pet clients can be hard on doors. 4. Rounded corners for easy cleaning. We create rounded corners to help you clean more easily, making a better environment for the pet. 5. Double cages build in versatility. Our Double Door (DD) cage latch assembly lets you house larger dogs or insert a divider for two smaller animals. You can remove the divider to slide in dogs following surgery. One cage has many uses. 6. Continuous innovation. The tighter spacing on the first five vertical cage rods on our small and mid-size cages help keep small paws from getting caught, which means we all worry less. This is just one example of our continuous improvement! 7. Low stress, quieting options. All Shor-Line stainless steel cages come with sound-dampening patches. We also worked with University researchers to develop a Silent Latch Mechanism that is available as an option on new or existing cages. 8. Durability you can depend on. Our craftspeople in Kansas City are so attentive to details and extremely high-quality work that Shor-Line cages last for decades. Pair that with our high-quality stainless steel and you have an investment you can pass down. Our cages rarely go on sale. 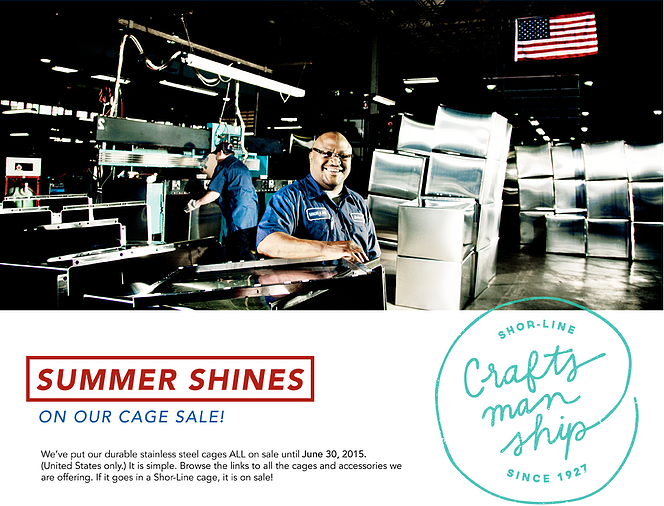 Take advantage of this sale that includes ALL stainless steel cages and cage accessories. If you would like to download a copy of the sales flyer, do so here. Don't forget, this sale only runs through June 30, 2015 and it is in the U.S. only. Any taxes and/or shipping charges are additional. The HSUS Animal Care Expo returns to New Orleans this week. It will recognize the 10th anniversary of the Hurricane Katrina disaster, which also became the largest animal rescue operation in U.S. history. Hurricane Katrina goes down as the third deadliest U.S. disaster, claiming 1,836 lives and doing $110 billion in damage. For pet lovers around the world, the heart-breaking stories of people being forced to leave their beloved pets behind mobilized the animal care community. There were many heroes in the stories that came out of New Orleans. And many of these heroes will be at this HSUS show. But for every rescued pet, there were 8-9 who did not survive. 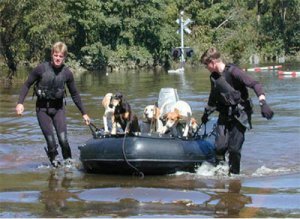 “The single most compelling fact for emergency managers to learn from Katrina was that approximately 44% of people who did not evacuate for Hurricane Katrina stayed, at least in part, because they did not want to leave their pets,” the Fritz Institute reported in 2006. This brings us to the second set of heroes—those who helped pass the Pet Evacuation & Transport Standards (PETS) Act in 2006 so that never again will people be forced to decide between their animals and their safety. Although the PETS Act was intended to protect humans, it had a surprising effect. In a study conducted post Hurricane Ike (Texas 2008) found that some evacuees left because they wanted to get their pets to safety. There continues to be work to be done to help people understand they can take their pets with them if they need to evacuate. Great progress has been made in creating plans to evacuate people with their pets and identify facilities to handle the influx. And, work to help displaced animals continues. The animal care community can take a bow for its world-leading efforts in championing the human-animal bond in disasters. The work HSUS and committed animal professionals have done has changed the fate of not just animals in the U.S. but around the world. At Shor-Line we are proud to be part of the animal care community. Check out the Shor-Line Booth at HSUS. We also have donated one of our newest innovations, the Kat Play-Around™, for the HSUS raffle. It provides multi-cat housing that keeps groups together in a kennel that lets cats be cats. It is just one of many products Shor-Line has developed to help the shelter community improve the lives of companion animals. See ya at the show! !